California's Eastern Sierra region, encompassing Inyo and Mono Counties, is a paradise of striking contrasts and beauty. Early settlers came to this area—now known chiefly for recreational activities such as fishing, hiking, and skiing—for its mining and agricultural prospects. Towns like Bodie, Lundy, and Keeler rose with the promise of quick riches but failed when the promise dimmed. Throughout this unique landscape are sprinkled the poignant resting places of early pioneers. Reflecting the diversity of the natural setting, the area's cemeteries range from the Mono County Cemetery overlooking Mono Lake to the overgrown cemetery at the Civil War–era Fort Independence to the garden cemeteries of Bishop. The monuments in these cemeteries, along with the beautiful country that surrounds them, honor the men and women who once carved lives out of this rugged wilderness. Author Gena Philibert-Ortega, a genealogist interested in the history of the West, conducts family history research, presents lectures, and writes for genealogical publications. 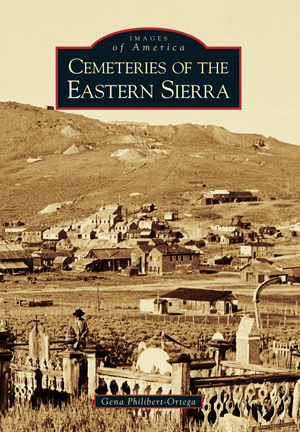 Using photographs from the archives of local museums and libraries, as well as from private collections, she illustrates the history of the cemeteries of the Eastern Sierra, showcasing some of California's little-known historic treasures.